GRCs are supposed to be ‘good’ for Singapore – they guarantee a permanent minority presence in Parliament. They started off by combining 3 single-member wards into one GRC, but SMCs were still dominant then. The controversies began when GRCs replaced SMCs as the dominant electoral structure; 3-member GRCs expanded into 4-member GRCs, then 5, 6; and ministers were distributed in all the GRCs to ‘take charge’ of MPs. These were compounded with the inexplicable carving of GRC boundaries; Marine Parade GRC stretches to Serangoon, central Singapore. Opposition-leaning single-member wards were subsequently absorbed into GRCs, and even GRCs with significant opposition support were dissolved and pieced off. Due to the massive size of GRCs – a typical 5-member GRC would have more than 100, 000 voters, and its relative large size to the entire voter population – the law of huge number kicks in. Unless there is a strong nation-wide swing against the incumbent governing party, it became very difficult for the opposition to capture a GRC, as the electoral outcome of any GRC has a tendency to reflect the national popular vote. Hence, between 1988 till now, opposition MPs came from SMCs only, when clearly in the same period, some S’poreans wanted more than two opposition MPs in Parliament. The PAP often likes to justify their actions by saying “it doesn’t matter, what works for Singapore is more important”. Yes, GRCs work in the sense that both the ruling and opposition parties must field minority candidates to win elections. Minority representation in Parliament is firmly entrenched, whoever wins or loses. GRCs might have created economies of scales for the running of town councils, but this is more of an after-thought consideration. Absorbing opposition-leaning SMCs into GRCs, dissolving opposition-leaning GRCs, or drawing boundaries here and there with no reason – opposition parties are unable to work on shifting grounds, or their supporters’ votes are diluted. Despite the fact that Singapore is a tiny city-state, electoral districts can spring up or splinter, when it is pretty clear the population distribution is even. Who benefits? Physical barriers – Singapore is a city, densely-populated, it shouldn’t be too hard to reach everyone staying within a particular neighbourhood. But in a GRC, multiply this neighbourhood by ten, twenty, or thirty folds. Of course, the opposition can be blamed for not attracting or mustering resources to cover an entire GRC of more than 100,000 voters. In larger countries, a single candidate typically represents such a population size. But Singapore is not that large. It doesn’t make sense to have mega electoral districts in this urban maze. Who benefits? Ministers who ‘anchor’ their team of MPs. New and young candidates are parachuted into GRCs to under-study their more experienced ministers and senior MPs. This political tutelage might be good for any party (even the Workers’ Party candidates in Aljunied rode on Low Thia Kiang’s experience), but voters seem to be at the losing end, as they can’t vote for or against an individual candidate. Their voting powers are again diluted. Of course, when all the candidates are equally good, S’poreans have no problems. But if one is a bad apple… Who benefits? So should GRCs still stay? I think all opposition parties have called for GRCs to be abolished, and even ordinary S’poreans too. There are several ways of ensuring minority representation in Parliament (or don’t even need it at all). One way is to declare some SMCs to be fielded by minority candidates only. I think some Chinese would be unhappy why only Malays or Indians have to represent them. Are S’poreans voting along ethnic or religious lines now? I’m not very sure. Such a proposal was probably considered before, and I believe MM Lee discarded it precisely because he believed some Chinese would be upset. What about reserved seats in Parliament, like an upper chamber? Good idea, but personally I think Singapore doesn’t need it – this is a city-state by political and geographical definitions, I don’t see so many ‘interests’ like rural areas, highlands, tribes etc to be represented. Unless the upper chamber consists of minorities only, to scrutinize legislation which might discriminate against them, but this role is apparently served by the President Council for Minority Rights. Then what about the lower chamber? What about the minority candidates in there? I think solutions along these lines to ensure permanent minority representation in Parliament always have some trade-offs. What we need is simplicity. So back to the GRCs. In my opinion, a 3-member GRC is quite ideal. The voter size for each GRC should be capped under 75, 000, so each MP serves about 25, 000 residents. This will slightly mitigate the effects of the law of huge numbers. So with 87 seats in the current Parliament, and with fifteen 3-member GRCs (45 seats), 42 seats will be allocated for SMCs, as opposed to 12 only in GE 2011. There will still be a minimum of 15 minority MPs, but with smaller-sized GRCs and forming only a slight majority of all elected seats. Why not two-member GRC? Possible too, but it would seem to voters the minority candidate has to borrow the other Chinese candidate’s help for his election bid. 3 is a good number, with more permutations; 1 minority (Malay or Indian/Others) with 2 Chinese, 2 minorities (Malay & Malay, Malay & Indian, Malay & Others, Indian & Others) with 1 Chinese, and possibly all minorities. More importantly, with smaller GRCs, there won’t be ridiculous Jurong GRC which doesn’t include Jurong West or Chua Chu Kang GRC which covers Jurong West etc this kind of situations. At the same time, there will be many SMCs so that many candidates will have to battle alone, instead of taking shelter in GRCs, which in any case will be smaller and easier to win or lose. GRCs or SMCs boundaries should be simple to understand, and easy to know why the boundaries are drawn in such a manner. For example, West Coast GRC covers a swath of area from Jurong Central to Clementi to Sentosa. If residents are puzzled, it is no wonder. Secondly, Singapore is a city-state. Any boundaries drawn is man-made and should not shift in every elections. If they shift, there must be a valid reason, like population growth. Lastly, why did the people drawing up the electoral map do this and that? What are their reasons? No one knows them exactly. Unless the PAP embarks on such reforms, they will always be saddled with accusations of unfairness. If they change, they will perhaps make themselves more palatable to all S’poreans. GE 2011 was an exceptionally bumper year for the opposition, as they fielded several strong candidates in as many wards as they could. But while the average vote share for the PAP in GRCs alone is around 60 percent, similar to the national vote share (due to the law of large numbers), the PAP vote share in the SMCs was different, roughly 58 percent. One reason it is lower is that Hougang was won by the WP, and Potong Pasir and Joo Chiat were marginally won by the PAP. But I believe in this year, it could have been lower. After all, discontent against the PAP is at an all-time high, due to rising cost of living, cost of housing and a liberal immigrant policy. Why did results in SMCs turn out slightly different? Yes, SMCs tend to produce results of greater deviation from the national popular vote share. With so many GRCs won by the PAP in the 50-odd percentage points, if they had been SMCs, a few would have fallen to the opposition. I was puzzled why some SMCs did not follow this trend, especially in the SMC scoring the only 7o percent point (considered a norm in older days). When I look at the PAP candidates in the top-scoring SMCs, they were indeed high-profile. Hong Kah North was won by Amy Khor, long-time office-holder; Radin Mas was won by Sam Tan, another office-holder; Yuhua was won by Grace Fu, a junior minister; Bukit Panjang by Dr Teo Ho Ping, who is personally popular in the ward; Whampoa by Heng Chee How, a junior minister. The PAP candidates in the rest of the SMCs were not as high-profile, but that doesn’t mean less capable. Pioneer, won by Cedric Foo, a former junior minister, reflected the national trend (60 percent scored by Cedric Foo). What’s more interesting is that, though the bottom-scoring PAP candidates were less low-profile, all of them had been the incumbent MPs (or for Sitoh, the ‘grassroots advisor’) of their wards for at least 5 years (exclude Charles Chong in Joo Chiat, who is a veteran MP but parachuted into the ward; Desmond Choo in Hougang). And against them, the opposition fielded newcomers, each of them clinching more than 40 percent of the votes. But against the high-profile PAP candidates in the top-scoring SMCs, the opposition fielded veterans, who lost big. It was a strategic error by the NSP and SPP to put those whom they considered ‘strong’ against the high-profile PAP candidates. Ironically, those who seemed strong had lost consecutive elections (Sin Kek Tong, Yip Yew Weng, Ken Sun, Steve Chia), compared to the WP’s newcomers, who polled more than 40 percent each, as they depended on the party reputation. In Yuhua and Bukit Panjang, it seems the SDP also committed a flaw in parachuting in Teo Soh Lung and Alec Tok respectively. Teo was a former ISA detainee…and that’s all everyone in Yuhua probably knows. For Tok, his switch to the SDP from the Reform Party, and his campaign in Bukit Panjang, seems a little too late and insincere to win the ward from the genuinely popular Dr Teo. Hence it boils down to individuality of candidates, age and party brand in the SMCs. If younger and new opposition candidates (perhaps Nicole Seah?) had stood against the high-profile PAP candidates in the SMCs, they might have done better, so following the national trend. In any case, the next elections might not present similar opportunities of discontent which the opposition could tap on in GE 2011. And of course, SMCs could appear and disappear, like magic. Derek da Cunha, an independent scholar in Singapore, suggested before that the ‘law of large numbers‘ in the GRC system makes it difficult for the opposition to win a GRC. Well, Aljunied GRC has been lost to the WP. Does the law of large numbers still stands? According to da Cunha, the more voters there are in a GRC, the results will tend to reflect nation-wide results. So for GE 2011, the PAP has a popular vote share of 60.14 percent. 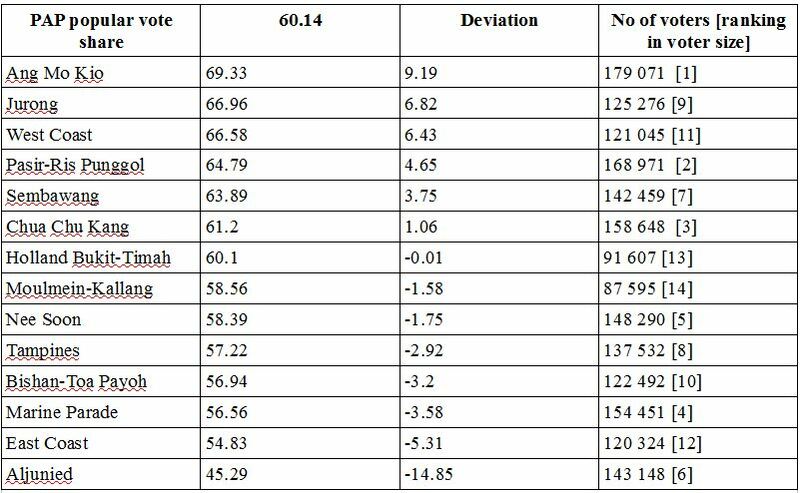 From the table above, you can see 10/14 GRCs have a deviation of +5 or -5 from the PAP popular vote share. Only West Coast, Jurong and Ang Mo Kio have more than +5 or -5 deviation. It’s easy to see why: West Coast and Ang Mo Kio were challenged by the newcomer Reform Party, resulting in above-average performances by the PAP. Jurong was contested by an unknown and weak NSP team. From the table, you can also see out of the five largest GRCs, only Ang Mo Kio deviated more than 5 percent from the PAP popular vote share. Even for the five smallest GRCs, only East Coast deviated slightly, at -5.31. Conclusion: GRCs have a tendency to reflect overall vote share. As long as overall support of the PAP remains above 50 percent, it is difficult to dislodge the incumbents. What happened in Aljunied was a combination of chance, strategic choices made by the WP, errors committed by the PAP and a general sense of discontentment. I’m not too sure if the WP or any other party can replicate this victory in a couple of GRCs in the next elections, if overall support for the PAP remains good. In SMCs, the biggest ward is Punggol East – 33 281, 18 percent the size of the largest GRC and 38 percent the size of the smallest GRC. The smallest ward is Potong Pasir, with only 17 327 voters. 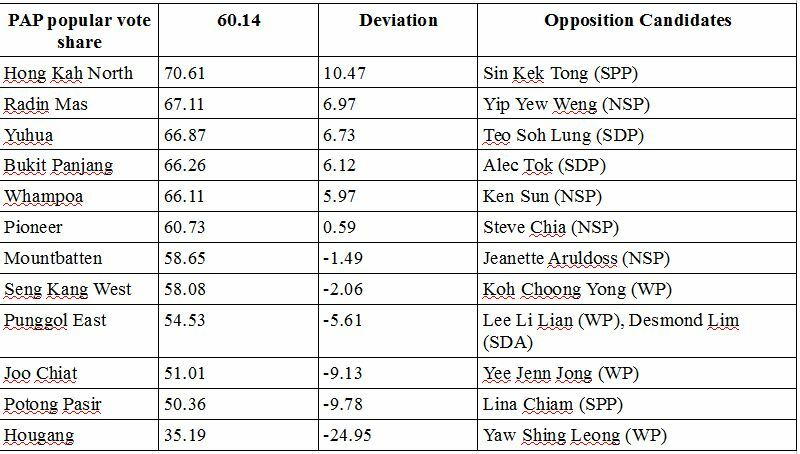 Only three SMCs kept within the +5 or -5 deviation limit which I set for the PAP popular vote share of 60.14 percent. 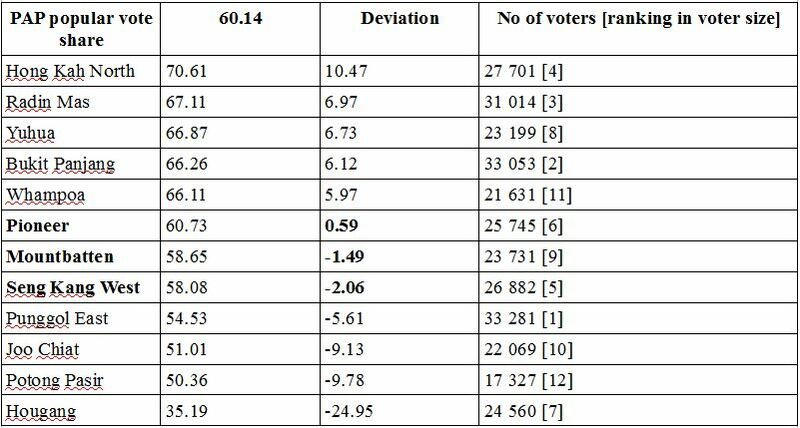 The deviation range can run from -24.95 to 10.47, with the results of most SMCs deviating from the popular vote share. SMCs, unlike GRCs, have a propensity to deviate from the popular vote share. This is because of the smaller number of voters in each SMC, and the law of large numbers does not hold here anymore. From a statistical point of view, it is easier for the incumbent to be knocked out (or hold onto power) in a SMC than in a GRC, because of the much smaller size of the SMC. Hence Potong Pasir and Joo Chiat were won by tight margins, while candidates for Hong Kah North, Radin Mas and Yuhua scored huge margins (they were also facing weaker opponents). As SMCs do not necessarily reflect the popular vote share, if George Yeo, Lim Hwee Hua and Zainul Abidin had stood in SMCs, they might have won easily, instead of squaring off against the WP’s dream team in Aljunied. Conclusion: SMCs might be easier to win (or lose), but with creation and destruction of SMCs in every elections, it is difficult for opposition candidates to work the ground and stand in a particular SMC. But the first-past-the-post system must also be considered, even winning by a 0.01 margin is also considered a win. SMCs tend to have such close margins, while GRCs do not. Hence the fear of such close fights might have led the PAP to enlarging the size of GRCs over the decades, while reducing the number of SMCs to a mere 12/87. In all, while the WP victory in Aljunied inflicted a psychological blow to the PAP, it was an exceptional one. Whether it can win in multiple GRCs throughout Singapore to control 1/3 of Parliament or even form the next government is greatly dependent on the national mood. If support for the PAP falls tremendously, in all likelihood GRCs will reflect this loss of support easily, as compared to SMCs, and many GRCs will be captured by the opposition. The PAP has won big through GRCs – and it might lose big through GRCs too. The first-past-the-post system and the GRC system have so far favoured the PAP, but if one day a perfect storm converges, it would be the biggest loser.